It was another record-setting weekend for the World's Loudest Month, as Monster Energy Carolina Rebellion reached new heights with more than 90,000 in attendance as the festival grew to three days (May 6, 7 & 8) in 2016. 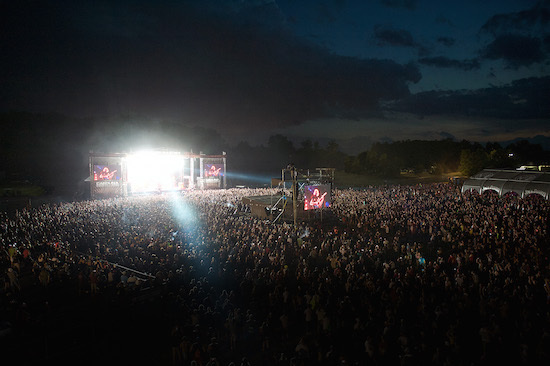 With over 60 bands on four stages at Rock City Campgrounds at Charlotte Motor Speedway in Concord, NC — and 12 hours of televised performances and backstage interviews on AXS TV — Monster Energy Carolina Rebellion was a full weekend of nonstop rock for fans in both the Mid-Atlantic and around the country. The 6th Annual Monster Energy Carolina Rebellion marked the launch of the legendary Scorpions' U.S. tour — part of their 50th Anniversary World Tour — with Motörhead's Mikkey Dee filling in on drums. The festival also featured performances from Rob Zombie, Disturbed, Five Finger Death Punch, Shinedown, Deftones, A Day To Remember, 3 Doors Down, Bring Me The Horizon, Cypress Hill, Pennywise, Lamb Of God, plus Rock & Roll Hall Of Famers Lynyrd Skynyrd and Alice Cooper, thrash pioneers Megadeth and Anthrax, and many more. While SiriusXM's Jose Mangin hosted AXS TV's hard-rocking televised coverage, fans at the festival and around the world were able to enjoy the quieter side of Monster Energy Carolina Rebellion with the Zippo Acoustic Sessions hosted by Alternative Press. Streamed live from Monster Energy Carolina Rebellion, the archived Zippo Acoustic Sessions can be viewed at the Alternative Press Facebook page (www.facebook.com/altpress) and the Monster Energy Carolina Rebellion Facebook page (www.facebook.com/CarolinaRebellion). "Expanding from two to three days for the first time in its six year history allowed for a more eclectic lineup…Throughout the weekend there was a defiant spirit that Carolina Rebellion and its sister festivals prove that rock — while it's not the sole chart-ruler it once was — is by no means dead…I was reminded of the camaraderie and community that these kinds of events create. In a global climate where so much emphasis is on division, the kind of unity music creates is greatly needed." "For the festival's sixth year, fans were treated to a wide range of performers as well as fantastic weather and a handful of standout moments." In addition to enjoying Monster Energy Carolina Rebellion's massive music lineup, festivalgoers were able to eat their way through a tour of great regional Gourmet Man Food at the expanded Pig Out BBQ Village. Fans rubbed elbows with their favorite bands during artist meet & greets at the Monster Energy, f.y.e., and The Music Experience tents — and lived their own rock star fantasies while trying the latest gear at The Music Experience. The Monster Energy Carolina Rebellion Ferris Wheel offered fans a singular vantage point of the entire festival grounds. Monster Energy Carolina Rebellion is produced by Danny Wimmer Presents and AEG Live and is part of the World's Loudest Month concert series, which features the biggest names in rock music performing in eight distinct U.S. concert atmospheres in April and May. The festival is supported by great corporate partners including Monster Energy, Bud Light, f.y.e., Jack Daniel's, The Music Experience, Zippo Encore, Deep Eddy Vodka, and Jägermeister.